Comments: ALTERNATE EDITION: PLEASE READ>>INSTRUCTOR REVIEW COPY>> marked INSTRUCTOR REVIEW COPY. Same content as student text. DAILY SHIPPING! FREE tracking info! Excellent Customer Service available to answer all inquiries. 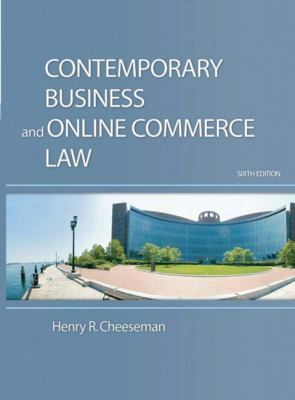 Henry Cheeseman provides a rich selection of landmark and contemporary cases for business students, including more cases on information technology and e-commerce law.Cheeseman, Henry R. is the author of 'Contemporary Business and Online Commerce Law', published 2008 under ISBN 9780136015000 and ISBN 013601500X.